As a Metairie Divorce Lawyer, we understand that family law matters can be a challenge. If you are going through a divorce, a child custody relocation dispute, or any other family law case, you may be uncertain of your future, worried, or afraid. At the Weiser Law Firm 3814 Veterans Memorial Boulevard Metairie, Louisiana 70002 504-358-0373 we believe in giving you hope by empowering you with information about your case and about the legal process. When you come to the Weiser Law Firm we will take the time to educate you about each of the steps that you will take as you make your way through the legal process. You will be aware of all of the choices you have ahead of you, as well as all of the possible outcomes that each choice may lead. You will not be left in the dark. We encourage you to visit our Metairie Divorce Lawyer Blog to learn more about this topic. We are compassionate and aggressive lawyers. We are committed to being there for you throughout the process, doing our part to relieve the stress that you are going through. We are dedicated to taking the steps necessary to meet your needs. Our philosophy is to first look for the path of least resistance, considering settlement or mediation to reach a resolution. If those paths do not lead in the right direction, we do not shy away for standing up for your needs in the courtroom. We are here for you. Criminal Defense work in Kenner, Lousiana and Jefferson Parish is a slightly different then in other jurisdictions. Misdemeanor cases in Kenner can go to three different courts: the City of Kenner Court, 1st Parish Court on David Drive in Metairie, or the 24th Judicial District in Gretna. All D.W.I. cases will go to first parish court, and all Class Four cases (misdemeanors) and up go to the 24th J.D.C. 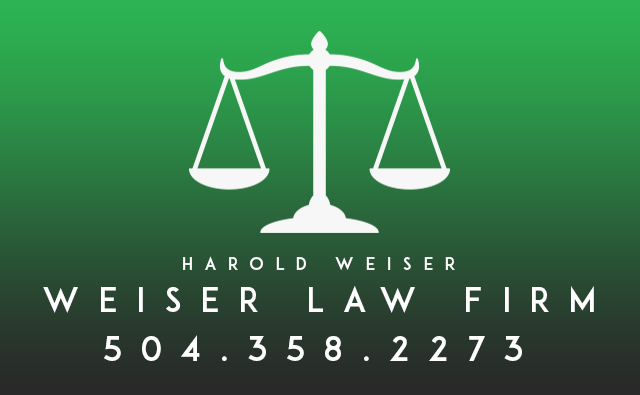 The Weiser Law firm handles many traffic ticket defenses in Jefferson Parish for a $100.00 plus court costs. When a person is arrested for felony charges in Kenner generally they are brought to the Kenner City Jail before being transported to the Jefferson Parish Prison in Gretna. Within 48 the defendant is generally brought in front of the Commissioner Judge in the Main Court House. After a bond is set they are returned to the Jail. Many defedants will be released within a day or so for prison overcrowding if they are charged with a non-violent or non-sexual crime. Once a defendant is released it is very important to hire an Criminal Defense Attorney. The Weiser Law Firm uses this time to talk to the screening department at the Jefferson Parish District Attorney’s Office. Prior to the charges being accepted there maybe an opportunity to reduce the prosecuted charges from the District Attorney’s Office, also other options such as the deversion program are done at this time. The Weiser Law Firm practices exclusively in Orleans and Jefferson Parish Courts making us very familiar with Court Personnel and Assistant District Attorney’s. Let us help you in your criminal defense matter today.